My first falcon sighting. To chance upon a Shikra, in the middle of urban Delhi, is surprising. Thanks to the drifter day, I got to notice it, perched on the branches of the tree next to my balcony, feeding on carrion. A long observation ensued. The bird was not nervy to my presence, as I had assumed. We both checked each other out aplenty. 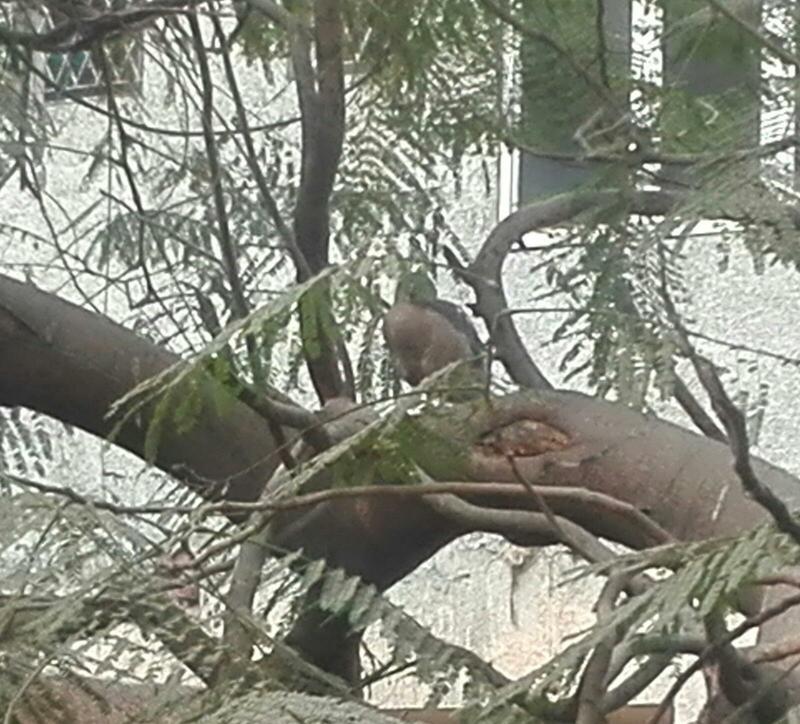 A very curious squirrel kept pestering the bird, while it lounged on its breaks between the feeding cycles. PS: Shikra derives from the word "shikari" or hunter, as it is trained and used in hunting by the falconers. It is comparable to a German Shepherd (of domesticated birds world), as in being a utility bird that could fetch game for other more prized birds. It also turns out that Shikra is not a falcon, but a type of hawk (also called "little banded goshawk") - an Accipiter. It probably was a female, "her" spots match more of whatever females I could find on Google for a confirmation. The shikra is a small raptor (26–30 cm long) and like most other Accipiter hawks, this species has short rounded wings and a narrow and somewhat long tail. Adults are whitish on the underside with fine rufous bars while the upperparts are grey. The lower belly is less barred and the thighs are whitish. Males have a red iris while the females have a less red (yellowish orange) iris and brownish upperparts apart from heavier barring on the underparts. The females are slightly larger. Armchair ornithology FtW. This is why we need surviving canopies in our residential areas.